While at the Walmart in Pflugerville today, I ran across the Slipper Genie!! 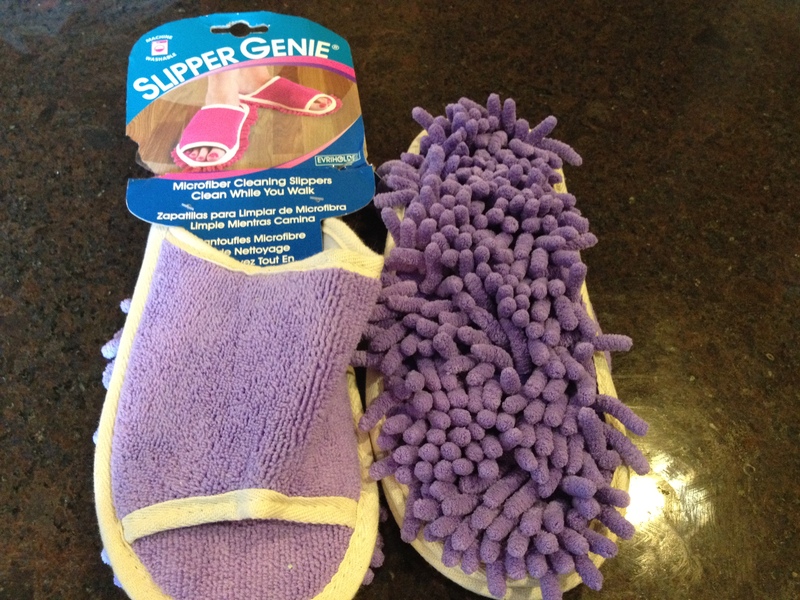 This slipper claims to clean your house as you walk around. Say no more!!!! I was SOLD when I read that. I hate to sweep and with my new dog, Cooper, shedding everywhere, it’s getting to the point that I have to sweep daily. Well, they were only about $5.00, so I bought them and I’m trying them out to see if they work!! They’re actually kind of comfortable, too! The other nice thing about them is that the sweeper part is velcroed on to the bottom of the slipper, so after a day of walking around my house cleaning, I can just remove the slipper sweeper part and throw it in the washing machine. I sure hope this works. I will NEVER sweep again if it does!!!! Why didn’t we think of this??? I KNOW!!! We need to come up with something silly like this and make a million dollars on it! !